És ez a fantasztikus koncert 2019. június 27-én a Budapest Arénában is látható lesz! Few ensembles in the history of recorded music have individually or collectively had a larger imprint on pop culture than the members of TOTO. As individuals, the band members can be heard on an astonishing 5000 albums that together amass a sales history of a half a billion albums. Amongst these recordings, NARAS applauded the performances with more than 200 Grammy nominations. With over 40 years together and literally thousands of credits, including the biggest selling album of all time: Michael Jackson’s Thriller, and accolades to their names, TOTO remains one of the top selling touring and recording acts in the world. TOTO’s own worldwide sales now surpass 40 million albums sold. They are pop culture, and are one of the few 70’s bands that have endured the changing trends and styles to a career enjoy a multi-generational worldwide fan base. 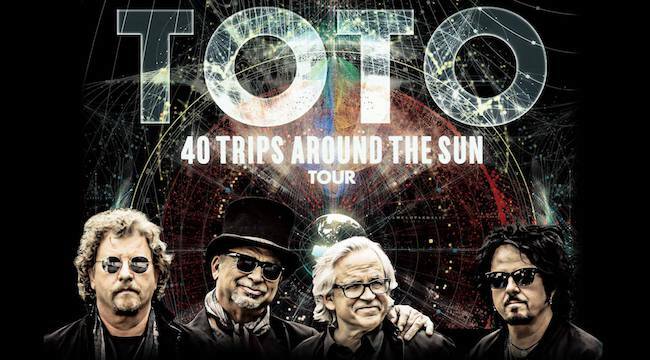 It’s without question, that TOTO are currently in the middle of a major resurgence around the world. The band’s brand new Greatest Hits package titled 40 Trips Around The Sun (Legacy Recordings - Sony) debuted in the Top 40 in eight different countries this past March. Most recently, Weezer’s covers of the classic TOTO hits “Rosanna” and “Africa” have attracted a ton of media attention along with a combined 20 million streams of the tracks online. It also triggered a resurgence of listeners to the original track which on Spotify alone has over 422 million streams. TOTO returned the favor to Weezer by recording and releasing their own version of “Hash Pipe." Their 40 Trips Around The Sun Tour in Europe and North America this year have seen them performing to packed houses every night including sold out stops at the Ziggo Dome in Amsterdam, Royal Albert Hall in London and The Ryman Auditorium in Nashville. The tour is the band’s most extensive run in years and is now extending deep into 2019 around the globe. This marvelous show will stop on June 27th, 2019 in Budapest Arena!